Sania dropped 10 places to 60 in the WTA rankings list released on Monday. This means that there would be loud speculations whether she will be able to play well in the upcoming 2008 Summer Olympics in China. Ganesha does an analysis of her Sun chart, as her birth time is not available. Tennis will be played from 10th to 16th August. In this period transiting Sun will be in applying square to her natal Sun and in applying opposition to her natal Mars, this will give her a strong challenging attitude and her play will be vigorous and give a tough time to her opponents. Transiting Mars will be in separating inconjunct aspect to natal Mars and in applying square to natal Neptune. This too will support her game and energy levels. 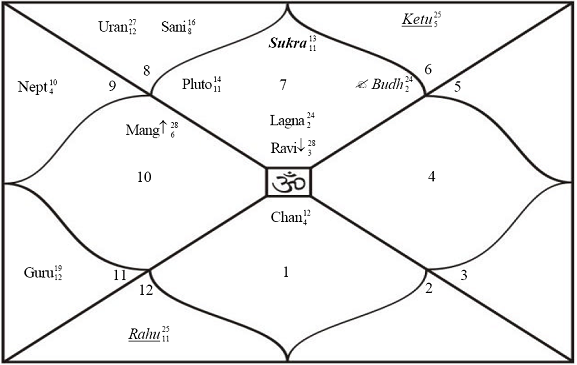 Transiting Rahu will be in separating conjunction to her natal Mars and in separating square to her natal Sun, this planetary aspect too seems to support her, but on a lesser scale as it is a separating aspect. Her chances of winning are brighter on 10th, 12th and 16th, definitely depending on her opponent’s chart too, but she will definitely give a tough time and play hard ball with her opponents especially on these days. In short Ganesha feels the Sania Mirza may have some respite from her current tough times where she has not been able to perform and maintain her status. Wishing her good luck and may Lord Ganesha bless her.